Usually, the challenge of reviewing a book is describing enough to accurately convey a sense of what the book’s about, and why you should or shouldn’t read it, without giving away too much. 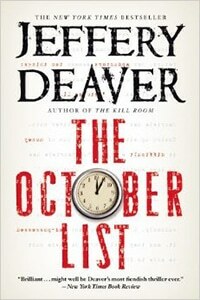 In Jeffery Deaver’s The October List, however, it’s pretty much essential that I not tell you anything about the plot, because of the way the story is told: in reverse. Let’s see if I can do it! In the opening scene, Gabriela McKenzie — whose young daughter has been kidnapped — sits in her New York apartment waiting to hear from her love interest Daniel Reardon, a fund manager who’s negotiating with the kidnapper, Joseph Astor. The hefty ransom includes not only $500,000 in cash but also a document called the “October List,” taken from Gabriela’s boss Charles Prescott, who has skipped town because of a police investigation of his investment firm — which means Gabriela can’t exactly go to the police for help, as she’s potentially implicated in whatever shady business Prescott was up to. Seems straightforward enough for an action thriller, right? AND YET. Each short chapter jumps backwards in time by an hour or two, revealing a private conversation, a clandestine meeting, or a dirty secret. Like a long camera shot that pulls back to reveal a larger and more complex scene, the big picture is gradually revealed, and it’s drastically different from the opening premise. The degree to which you find this sort of trickery fun is precisely the degree to which you’ll enjoy this novel. Certainly, some readers will dismiss this as cheap gimmickry, and I see their point: it’s not “fair” on the reader in the sense that careful reading will not help you, and essential information is withheld throughout. Either you accept its artificiality and enjoy watching the book’s clever construction unfold, or you don’t. On the other hand, those who like this sort of thing will have fun flipping back and forth afterward, double-checking details and realizing how everything comes together (which is why I’d recommend reading this as a print book; e-books are harder to riffle through rapidly). The writing itself is not particularly strong, although with all the chronological hijinks, it would probably be distracting to have to pay attention to good writing while also figuring out the mystery. Let’s just say it’s written in a typically thriller-ish tone that veers at times into the overdone or clichéd, but mostly it does its job in propelling the action forward while dropping the occasional tantalizing hint. If you liked the movie Memento (remember that? ), then you’ll probably enjoy The October List. It’s a fast, action-packed read, and as long as you know what you’re getting into, I think you’ll find it an interesting and mostly successful experiment.